Where Member States authorise the placing in service of rolling stock, they have to ensure that an identification code is assigned to each individual vehicle. This code should then be entered in a national vehicle register (hereafter NVR). This register must be accessible for consultation by authorised representatives from competent authorities and stakeholders. The different national registers should be consistent as regards data contents and data formatting. This requires their establishment on the basis of common operational and technical specifications. The common specifications for the NVR should be adopted on the basis of the draft specification prepared by the European Railway Agency (hereafter the Agency). These draft specifications should include in particular the definition of: the content, the functional and technical architecture, the data format, the operating modes, including rules for data input and consultation. This Decision has been prepared on the basis of the recommendation of the Agency No ERA/REC/INT/01-2006 dated 28 July 2006. The NVR of a Member State should contain all vehicles authorised in that Member State. However freight wagons and passenger cars should be only registered in the NVR of the Member State where they are first placed in service. A standard form should be used for purposes of vehicles registration, confirmation of registration, alteration of registration item(s) and confirmation of the change(s). Each Member State should establish a computer-based NVR. All NVRs should be linked to a central Virtual Vehicle Register (hereafter VVR) managed by the Agency in order to establish the register of documents on interoperability provided for Article 19 of Regulation (EC) No 881/2004 ( 3 ). The VVR should allow users to search all NVRs through a single portal and enable exchange of data between national NVRs. However, for technical reasons, the link to the VVR cannot be set up immediately. Therefore, Member States should only be required to connect their NVRs to the central VVR once the effective functioning of the VVR has been demonstrated. To this end, the Agency will carry out a pilot project. According to item No 8 of the minutes of the meeting No 40 of the Regulatory Committee established under Article 21 of Directive 2001/16/EC, all existing vehicles should be registered in the NVR of the Member State where they were formerly registered. The transfer of data should take into account an adequate transition period and data availability. In accordance with Article 14(4)(b) of Directive 96/48/EC and Article 14(4)(b) of Directive 2001/16/EC, the NVR should be kept and updated by a body independent of any railway undertaking. Member States should inform the Commission and the other Member States of the body which they have designated for this purpose, inter alia, in order to facilitate the exchange of information between these bodies. Some Member States have an extensive 1 520 mm gauge network operating a fleet of wagons that is common to the Commonwealth of Independent States (CIS) countries. This has resulted in a common registration system that is an important element of the interoperability and safety of this 1 520 mm network. This specific situation should be recognized and specific rules established to avoid lack of consistency in the EU- and CIS-related obligations for the same vehicle. The rules laid down in Annex P of the TSI on traffic operations and management are applicable with regard to the numbering system of vehicles for the purpose of registration in the NVR. The Agency will develop a guide for the harmonised application of these rules. The common specifications of the National Vehicle Register in accordance with Article 14(5) of Directive 96/48/EC and Article 14(5) of Directive 2001/16/EC, as set out in the Annex, are hereby adopted. Appendix 6 of the Annex of this Decision shall apply from 1 January 2014. When registering vehicles after the entry into force of this Decision, Member States shall use the common specifications laid down in the Annex. Member States shall register existing vehicles as provided for in section 4 of the Annex. 1. In accordance with Article 14(4)(b) of Directive 96/48/EC and Article 14(4)(b) of Directive 2001/16/EC, Member States shall designate a national body which shall be responsible for the keeping and updating of the National Vehicle Register. This body can be the National Safety Authority of the Member State concerned. Member States shall ensure that these bodies cooperate and share information in order to ensure that data changes are communicated in a timely manner. 2. Member States shall inform the Commission and the other Member States, within one year of the entry into force of this decision, of the body designated in accordance with paragraph 1. 1. Rolling stock placed in service for the first time in Estonia, Latvia or Lithuania and intended to be used outside the European Union as part of common 1 520 mm rail system wagons fleet shall be registered in both the NVR and the Information Database of the Council of Railway Transport of the Commonwealth of Independent States. In this case, the 8-digit numbering system may be applied instead of the numbering system specified in the Annex. 2. Rolling stock placed in service for the first time in a third country and intended to be used inside the European Union as part of the common 1 520 mm rail system wagons fleet shall not be registered in the NVR. However, in conformity with article 14(4) of Directive 2001/16/EC, it must be possible to retrieve information listed in Article 14(5)(c), (d) and (e) from the Information Database of the CIS Council of Railway Transport. The data format of the national vehicle register (hereinafter referred to as ‘NVR’) is as follows. 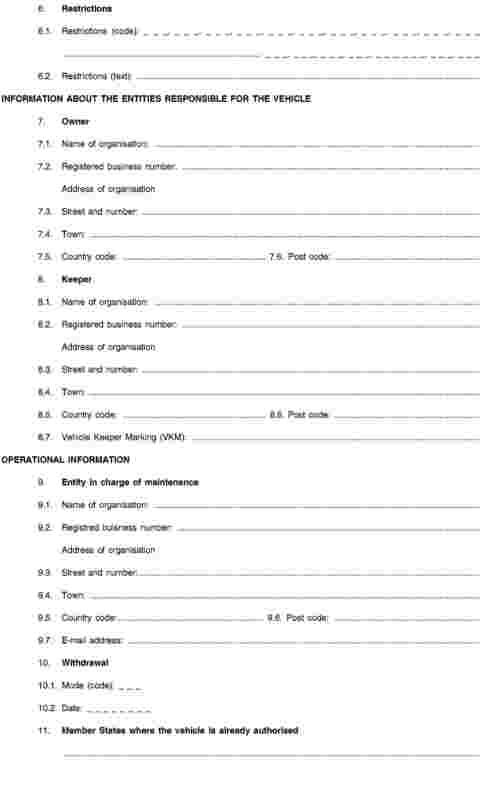 The item numbering follows the logic of the proposed standard registration form in Appendix 4. In addition, field(s) may be added such as comments, identification of vehicles under investigation (see Section 3.4), etc. (2) For vehicle types authorised in accordance with Article 26 of Directive 2008/57/EC. (3) The register provided for in Article 34 of Directive 2008/57/EC. (4) Authorisation delivered in accordance with Chapter V of Directive 2008/57/EC or authorisation delivered in accordance with the authorisation regimes existing before transposition of Directive 2008/57/EC. Several registers are being set up partly as a consequence of the new EU regulatory regime. The table below summarises which registers and databases might have links with the NVR when they are implemented. (1) The Registration Entity (‘RE’) is the entity designated by each Member State, in accordance with Article 33(1)(b) of Directive 2008/57/EC, for keeping and updating the NVR. (2) As provided for in the Luxembourg Protocol to the Convention on International Interests in Mobile Equipment on matters specific to railway rolling stock, signed in Luxembourg on 23 February 2007. — OTIF registers: OTIF registers are being developed taking account of the EU vehicle registers. The architecture of the whole system, as well as the links between the NVR and other registers, will be defined in such a way as to allow retrieval of the requested information when necessary. The NVR registers will be implemented by means of a decentralised solution. The objective is to implement a search engine for distributed data, using a common software application, to allow users to retrieve data from all the Local Registers (LR) in the Member States. NVR data will be stored at national level and will be accessible using a web-based application (with its own web address). — the National Vehicle Register(s) (NVR), which are the LR in the Member States. The Member States can use the standard NVR (sNVR) developed by the Agency or develop their own applications in conformity with this specification. In the latter case, for communication by the NVR with the VVR the Member States will use a Translation Engine (TE) developed by the Agency. 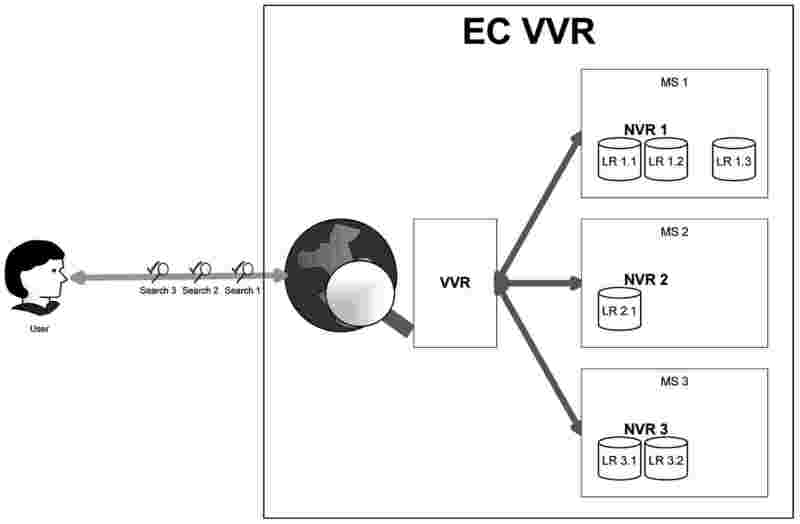 — allow connections between the NVRs and the VVR, using common standards and terminology. — following up a particular vehicle. The form to be used is in Appendix 4. — RE of the first Member State where it intends to operate, for a vehicle coming from a third country. 3.2.2. Registering a vehicle and issuing a European Vehicle Number. In the case of first registration, the RE concerned issues the European Vehicle number. 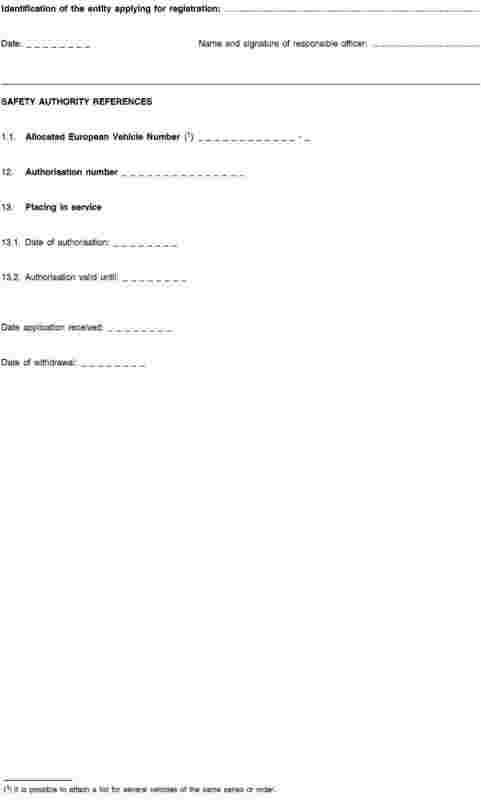 It is possible to have a separate registration form per vehicle or a single form for a whole set of vehicles of the same series or order with a list of the vehicle numbers attached. The RE must take reasonable steps to ensure the accuracy of the data it enters in the NVR. To this end the RE can request information from other REs, in particular when the entity applying for registration in a Member State is not established in that Member State. — enters the new content of the modified item(s), and then forwards the form to the REs of all the Member States where the vehicle is registered. The use of the standard form might not be sufficient for certain cases. If necessary, the RE concerned may therefore submit additional documents in either paper or electronic form. Unless otherwise specified in the registration documents, the keeper of the vehicle is considered to be the ‘registration holder’ in the meaning of Article 33(3) of Directive 2008/57/EC. Should a keeper change, it is the responsibility of the currently registered keeper to notify the RE and the RE has to notify the new keeper of the change of registration. The former keeper is removed from the NVR and relieved of its responsibilities only when the new keeper has acknowledged its acceptance of keeper status. If on the date of de-registration of the currently registered keeper no new keeper has accepted the keeper status, the registration of the vehicle is suspended. In cases where, in accordance with the OPE TSI, due to technical changes, the vehicle has to be given a new EVN, the registration holder shall inform of these changes and, if applicable, of the new authorisation for placing in service the RE of the Member State where the vehicle is registered. This RE shall assign to the vehicle a new EVN. The entity applying for withdrawal of registration ticks the ‘Withdrawal’ box. 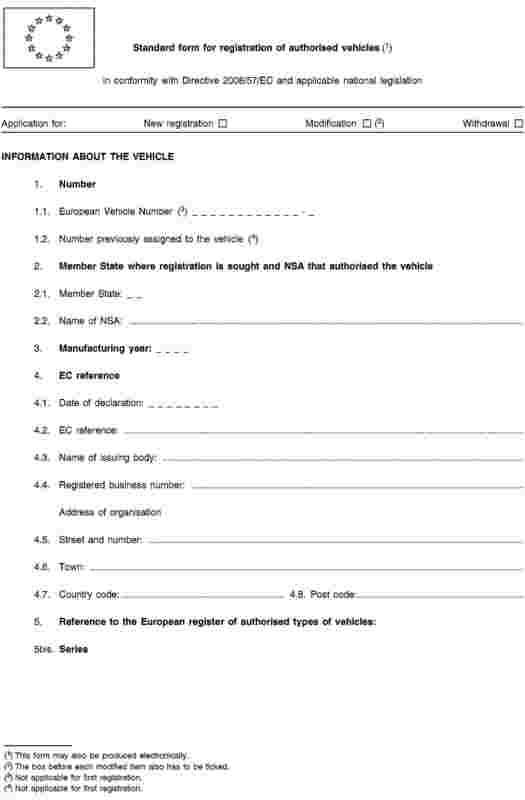 It then fills in item No 10 and forwards the form to the REs of all the Member States where the vehicle is registered. The RE delivers the withdrawal registration by filling in the date of withdrawal and acknowledging the withdrawal to the entity. 1. When a vehicle equipped with a driving cab already authorised and registered in one Member State is authorised in another Member State, it must be registered in the NVR of the latter Member State. In this case, however, only data relating to items 1, 2, 6, 11, 12 and 13 and, where relevant, data relating to the fields added to the NVR by the latter Member State are to be recorded, as only these data relate to the latter Member State. This provision is applicable as long as the VVR and the links with all relevant NVRs are not fully operational and, during this period, the REs concerned will exchange information in order to ensure that data relating to the same vehicle are consistent. 2. Vehicles not equipped with a driving cab, such as freight wagons, passenger cars and some special vehicles, are registered only in the NVR of the Member State where they are first placed in service. 3. For any vehicle, the NVR where it is firstly registered contains the data relating to items 2, 6, 12 and 13 for each of the Member States where an authorisation for placing in service has been granted to this vehicle. All data in the NVR must be retained for 10 years from the date of withdrawal of a vehicle registration. As a minimum, data must be available online for the first 3 years. After 3 years, data may be kept either electronically, in paper form or in any other archiving system. If at any time during the 10-year period an investigation involving a vehicle or vehicles is started, data relating to these vehicles must be retained beyond the 10-year period if so required. After withdrawal of a vehicle registration, any of the registration numbers assigned to the vehicle must not be assigned to any other vehicle for 100 years from the date the vehicle is withdrawn. Any changes in the NVR should be recorded. The management of historical changes could be addressed by IT solutions. The 13 data items retained are listed below, with an indication as to which are compulsory and which are not. These vehicles should keep their current number. The 12-digit number should be registered as such without any modification. — Hungary, with the main country code 55 and the specific code 43 for GySEV/ROeEE (Győr-Sopron-Ebenfurti Vasút Részvénytársaság/Raab-Ödenburg-Ebenfurter Eisenbahn). These vehicles should keep their current number. The 12-digit number should be registered as such without any modification ( 4 ). The IT system has to consider both codes (main country code and specific code) as relating to the same country. — A 12-digit number (according to OPE TSI) defined in accordance with the vehicle’s characteristics is allocated in the NVR. The IT system should link this registered number to the current vehicle number. — For vehicles used in international traffic, except those reserved for historical use: the 12-digit number is physically applied to the vehicle itself within a period of 6 years after allocation in the NVR. For vehicles used in domestic traffic and for those reserved for historical use: the physical application of the 12-digit number is voluntary. The item ‘Member State’ must always refer to the Member State where the vehicle is registered in its NVR. For vehicles from third countries, this item refers to the first Member State that authorised the vehicle to be placed in service on the European Union rail network. The item ‘NSA’ refers to the entity that delivered the authorisation for placing the vehicle in service. Where the manufacturing year is not known precisely, the approximate year should be entered. Normally such a reference does not exist for existing vehicles except for a handful of HS RS. To be recorded only if available. To be recorded only if available. Until ERATV is set up, reference may be made to the Rolling Stock Register (Article 22a of Council Directive 96/48/EC ( 5 ) and Article 24 of Directive 2001/16/EC of the European Parliament and of the Council ( 6 )). Compulsory and normally available. The VKM (unique code as indicated in the VKM register) must be entered if the keeper has it. Normally, RIV wagons, RIC coaches and vehicles under bilateral or multilateral agreements are registered as such. If this information is available it should be recorded accordingly. Where the date of placing into service is not known precisely, the approximate year should be entered. The entity previously responsible for vehicle registration is to make all information available to the NSA or RE of the country where it is located. Existing freight wagons and passenger cars are to be registered only in the NVR of the Member State where the former registration entity was located. If an existing vehicle had been authorised in several Member States, the RE that registers this vehicle sends the relevant data to the REs of the other Member States concerned. The NSA or RE includes the information in its NVR. Restrictions (technical characteristics) already recorded in other registers to which NSAs have access do not need to be repeated in the NVR. Therefore, such information does not need to be repeated in the NVR. — 3rd level: Value or specification. (1) If the vehicle is equipped with more than one B system, an individual code for each system must be indicated. — 1xx is used for a vehicle equipped with a signalling system, — 2xx is used for a vehicle equipped with radio. — the second digit specifies the document subtype. (1) If the four digits reserved for Field 4 ‘Counter’ are fully used within a year, the first two digits of Field 2 will change respectively from: — [5 1] to [5 5] for tractive vehicles, — [5 2] to [5 6] for hauled passenger vehicles, — [5 3] to [5 7] for wagons, — [5 4] to [5 8] for special vehicles. (2) The digits allocated in Field 4 are: — from 1 000 to 1 999 for traction vehicles, — from 2 000 to 2 999 for hauled passenger vehicles, — from 3 000 to 3 999 for wagons, — from 4 000 to 4 999 for special vehicles. This Field indicates the year (in the specified format yyyy, i.e. four digits) in which the authorisation was issued. The counter is a progressive number incremented by one unit each time a document is issued, regardless if it is a new, renewed or updated/amended authorisation. Even where a certificate is revoked or an authorisation is suspended, its number cannot be used again. Every year the counter restarts from zero. The vehicle has a valid registration. The vehicle’s registration is suspended at the request of the owner or keeper or by a decision of the NSA or RE. The vehicle is destined for storage in working order as an inactive or strategic reserve. The vehicle is known to be reregistered under a different number or by a different NVR, for continued use on (all or part of) the European railway network. The vehicle’s registration for operating on the European railway network has ended without known reregistration. The vehicle is destined for continued use as a rail vehicle outside the European railway network. The vehicle is destined for the recovery of major interoperable constituents/modules/spares or major rebuilding. The vehicle is destined for scrapping and disposal of materials (including major spares) for recycling. The vehicle is destined to be ‘historic preserved rolling stock’ for operation on a segregated network, or for static display, outside the European railway network. — If the reason for withdrawal is not specified, codes 10, 20 and 30 are to be used to indicate the change of registration status. — If the reason for withdrawal is available, codes 11, 31, 32, 33 and 34 are options available within the NVR database. These codes are based solely on information provided by the keeper or owner to the RE. — A vehicle that has its registration suspended or withdrawn may not operate on the European railway network under the recorded registration. — A reactivation of a registration after suspension will require the verification by the registration entity of the conditions which caused the suspension. — A transfer of registration under the conditions set out in Article 1b of Commission Decision 2006/920/EC ( 7 ) and Article 1b of Commission Decision 2008/231/EC ( 8 ), as amended by Decision 2010/640/EU ( 9 ), consists of a new registration of the vehicle and subsequent withdrawal of the old registration. In a given country, the 7 digits of technical characteristics and serial number are sufficient to identify uniquely a vehicle inside the groups of hauled passenger vehicles and special vehicles ( 10 ). (c) abbreviations of the technical characteristics (details in part 12 for the wagons, part 13 for the hauled passenger vehicles). A Vehicle Keeper Marking (VKM) is an alphabetic code, consisting of 2 to 5 letters ( 11 ). A VKM is inscribed on each rail vehicle, near the European Vehicle Number. The VKM identifies the Vehicle Keeper as registered in a National Vehicle Register. Letters may contain diacritical signs ( 12 ). Diacritical signs used by these letters are ignored for checking uniqueness. — a vehicle keeper has good cause to distinguish between separate vehicle fleets within his organisation. — that has mandated a separate, single legal entity for handling all issues on their behalf, in which event the legal entity is the keeper. — the complement required to bring the unit’s digit to 10 forms the check-digit; should this units digit be nought, then the check-digit will also be nought. (1) According to the alphabetical coding system described in Appendix 4 to the 1949 convention and Article 45(4) of the 1968 convention on road traffic. (1) Commission Regulation [TSI WAG as adopted after the revision]. (2) Fixed or variable gauge. (3) Except for wagons in category I (temperature-controlled wagons), not to be used for new vehicles authorised placed in service. (1) Compliance with the applicable TSIs, see appendix P, part 5. ( 1 ) OJ L 235, 17.9.1996, p. 6. Directive as last amended by Commission Directive 2007/32/EC (OJ L 141, 2.6.2007, p. 63). ( 2 ) OJ L 110, 20.4.2001, p. 1. Directive as last amended by Commission Directive 2007/32/EC). ( 3 ) OJ L 164, 30.4.2004, p. 1, as corrected by OJ L 220, 21.6.2004, p. 3. ( 4 ) However, any new vehicles placed in service for AAE, BLS, FNME and GySEV/ROeEE are to be given the standard country code. ( 5 ) OJ L 235, 17.9.1996, p. 6. ( 6 ) OJ L 110, 20.4.2001, p. 1. ( 7 ) OJ L 359, 18.12.2006, p. 1. ( 8 ) OJ L 84, 26.3.2008, p. 1. ( 9 ) OJ L 280, 26.10.2010, p. 29. ( 10 ) For special vehicles, the number has to be unique in a given country with the first digit and the 5 last digits of the technical characteristics and serial number. ( 11 ) For NMBS/SNCB, the use of an encircled single letter B can be continued. ( 12 ) Diacritical marks are ‘accent-signs’, such as in À, Ç, Ö, Č, Ž, Å etc. Special letters such as Ø and Æ will be represented by a single letter; in tests for uniqueness Ø is treated as O and Æ as A.